It’s easy to explore Hiroshima by public transport. And it’s very easy to travel between Hiroshima and Miyajima. Once on the island of Miyajima, you can get everywhere on foot. Here are all the details. The best way between Hiroshima Station and the Peace Memorial Park is a tram from in front of the South Exit of Hiroshima Station. Take tram #2 or #6 to Genbaku-domu-mae (A-Bomb Dome). It takes around 12min and costs Y160. A taxi between Hiroshima Station and the Peace Memorial Park costs around Y1,200 and takes 10 minutes. The fastest and most convenient way between Hiroshima and Miyajima is the Aqua Net Ferry directly from the Peace Memorial Park to Miyajima (or vice-versa). It takes 45 minutes and costs Y2,000/3,600 one-way/return. A slower but cheaper way between Hiroshima and Miyajima involves taking a train between Hiroshima Station and Miyajima-guchi Station (26 minutes, Y260) and then a ferry between Miyajima-guchi Pier and Miyajima (10 minutes, Y180). The ferry and train are covered by the JR Pass. Hiroshima is a moderately large city, however, if you’re staying at a hotel in Downtown Hiroshima, you can explore the city on foot. Thus, you probably only need to take public transport two times: A tram or taxi from Hiroshima Station to your hotel and back. (See lower on this page for details on traveling from Hiroshima to Miyajima). 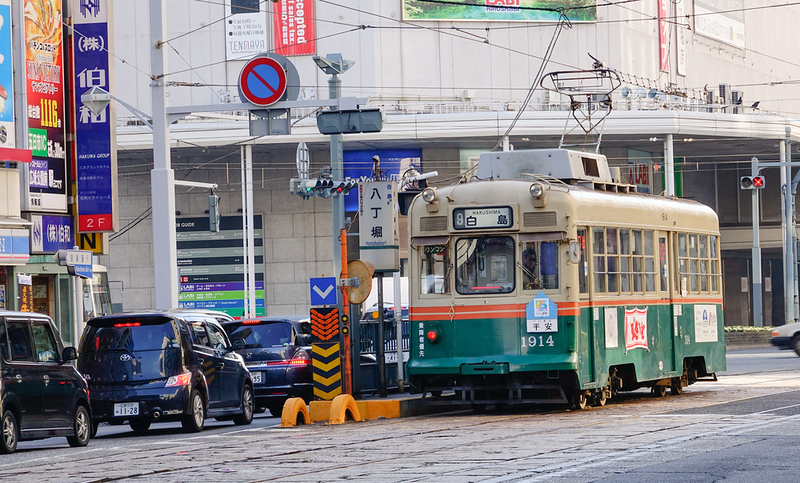 Along with taxis, street trams are the best way to get around Hiroshima. You’ll probably only need to use them when traveling between Hiroshima Station and your downtown hotel, but if you’re staying in a hotel near the station, you’ll have to use them more. The trams are operated by Hiroshima Dentetsu (Hiroden, for short). There’s a stop right outside the south exit/entrance of Hiroshima Station. Routes #2 (red) and #6 (yellow) will take you to Genbaku-dome-mae (A-Bomb Dome) station, the closest station to the Peace Park, in about 10 minutes. These routes will also take you to Downtown Hiroshima. Route #1 (orange) will take you to the southern parts of Downtown Hiroshima. There’s a flat fee of Y160 for rides within the city. You can also pay with an IC card. You can buy a one-day pass for Y600 at the tram terminal at Hiroshima Station or from tram drivers, but it’s unlikely that you’ll use it enough to save money. Taxis are a very good way to get around Hiroshima, especially for that first ride from the station to your hotel (who really wants to lug suitcases onto a street tram?). If you have four people, a taxi probably won’t cost that much more than four tram fares anyway. A taxi from Hiroshima Station to the Peace Memorial Park will cost around Y1,200 and take around 10 minutes. A taxi from Hiroshima Station to most downtown hotels will cost slightly less and be slightly faster. Hiroshima has an extensive local bus service. It’s unlikely that you will need to make use of it, but there are two lines that are of some interest to foreign travelers: the green and orange Hiroshima Sightseeing Loop Buses (Meipuru-pu buses) that stop at Hiroshima Station and make loops of the main sights, including the Peace Park. A single ride on these buses costs Y200 and a day pass costs Y400 (you can buy these passes from drivers). Note that these two buses are covered by the Japan Rail Pass. It’s very easy to travel from Hiroshima to Miyajima. The easiest and most convenient way is the direct ferry between the Peace Memorial Park and Miyajima. The other main way is to take a train or tram from Hiroshima Station to Miyajima-guchi and then a ferry from there to the island. Aqua Net Ferry runs a direct express ferry between Motoyasu Pier and the pier at Miyajima. Motoyasu Pier is on the east bank of the river just south of Motoyasu-bashi Bridge, which is just downstream of the A-Bomb Dome. It takes 45 minutes and costs Y2,000/3,600 one-way/return. They leave just about every hour, but may be cancelled during really low tides. If you want to travel from Hiroshima Station to Miyajima (or vice versa), the best way is to take the JR San-yo Line from Hiroshima Station west to Miyajima-guchi Station (26 minutes, Y260) and then a ferry between Miyajima-guchi Pier and Miyajima (10 minutes, Y180). The ferry and train are covered by the JR Pass. Note that you can also take the Hiroden Street Tram from Hiroshima Station to Hiroden Miyajima-guchi Station (70 minutes, Y260) but this is a very slow way to go. Regular ferries run between Miyajima-guchi and Miyajima (about 10 minutes, Y180). Once you arrive on the island of Miyajima, you can walk everywhere. The only exception might be if you want to get up Mt. Misen, in which case you might want to use the Miyajima Ropeway (cable car). Many people take the ropeway up and then hike down. The bottom station of the ropeway is in the valley above Momiji-dani-koen Park. The ropeway consists of two sections: a lower gondola section and an upper cable car section. The fare to the top is Y1,000/Y1,800 one-way/roundtrip. The ride to the top takes about 30 minutes.